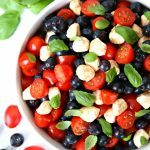 This Red, White, and Blueberry Caprese Salad is a festive 4th of July side dish that is perfect for your holiday cookout. Celebrate Indepedence day with a refreshing caprese salad full of tomatoes, mozzarella cheese, blueberries, basil and topped with balsamic vinegar. Add tomatoes, blueberries, and mozzarella balls in large bowl. Toss with balsamic vinegar until tomatoes, cheese, and blueberries are evenly coated. Top with basil leaves. Larger leaves can be cut into smaller pieces.